The most important part of your upcoming project is the artwork. Print Ready Artwork means that we are able to print the artwork exactly as we receive it. This rarely happens. But don’t fear! We are here to help and walk you through every step of the way. It’s all about the resolution. We require a resolution of 150 dpi (dots per inch) when enlarged to full-scale to insure a beautiful and flawless delivery. Color will look different on your computer screen and cell phone which use projected Red, Blue, and Green, (RGB) light to create color. Your computer screen may also have different color settings than your colleagues’ computers, affecting your view of color. Then how do we know what color to print? We use CMYK percentages (Cyan, Magenta, Yellow, Black), which define each color and give us a map to produce your artwork. Once we receive your artwork, we will run a Digital Proof to quickly identify that we have the correct resolution, CMYK colors, fonts, and links. Please note that Digital Proofs cannot be used for color proofing. Upon request, we can use Quarter Scale Proofs for viewing the final design and Strip Proofs to view the resolution of a 6” wide “strip” at full-scale. For color critical decisions we can produce a Color Proof to identify the precise color using the same material and printing process to be used for the final production. Plan for delays so you can have your print on time, if not early. We suggest a timeline with a minimum of two weeks from the time Print Ready Artwork is presented. Remember that we need time to produce, sew, and test fit your print prior to shipping. 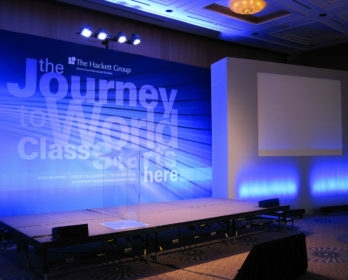 Chances are we have drafted multiple design options for your event. Please check with your producer to make sure you have the correct dimensions before your designer begins their work. Remember we require a resolution of 150 dpi when enlarged to full-scale. Include your CMYK percentages, Fonts, and Links. For more detailed information please click this link to download our Detailed Artwork Requirements. All art work will go thru our pre flight process. Please double check that your file includes all the support folders of fonts and links including a pdf for us to quickly reference the current version. Missing fonts and links are one of the most common causes for project delays. Dye Sublimation is the process of sublimating ink (fusing ink), to fabric on a molecular level using heat. This means the fabric retains its original stretch characteristics. This is very important because we put all our fabrics under tension to remove ripples and wrinkles. Dye Sub was originally produced by first printing to paper and then using heat to transfer the ink from the paper to the fabric. Thanks to new technologies we can now print directly to the fabric with the same accuracy before heat is applied to sublimate the ink. It depends on what design elements are most important to your client as you will have to balance their design goals with their design budget. Here are some questions you should consider before moving forward. 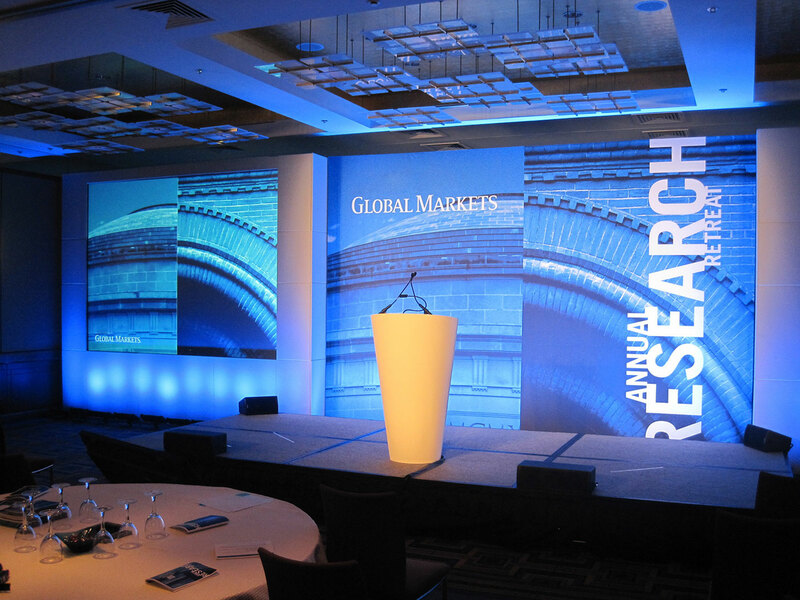 Does your client prefer a seamless backdrop regardless of expense or are they more concerned with trying to work with in a limited design budget? Does the design lend itself to concealing seams or will seams interrupt the beauty of the design? 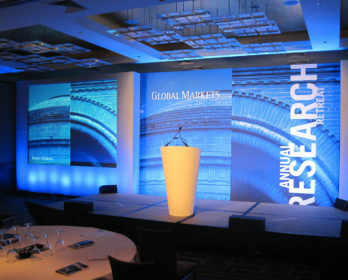 A popular compromise between design and budget uses a seamless 10’ tall dye sub print elevated on a Hard Panel Scenic base. Why Are Digital Proofs So Accurate? Due to advances in print software and color technology, we can ensure our printers are always correctly calibrated to the CMYK color targets included in your artwork. This means perfect reproduction of color every time. Printed proofs are used to check different elements of the design that are causing concern before it goes into production. Quarter Scale Proof is a great way to check the overall design and see it produced on fabric. It is roughly 2’ x 4’ in size and shows the entire graphic on the same material with the same process to be used for the final production. Strip Proof is used to check the resolution of a print at full-scale. We select the area on the design that is of the greatest client concern and produce it on the same material with the same process to be used for the final production. Color Proof is used to identify the precise, preferred color match for a client logo or color critical area of a the design. Because fabric represents color differently than paper and color is subjective to the viewer this is the best way to confirm specific colors prior to going into production. As you begin your design, remember to keep your logo and letters in a clear field. 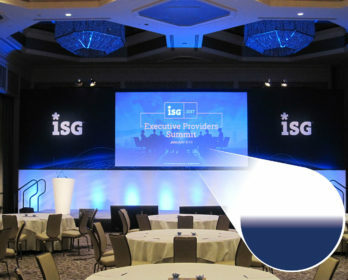 Although it looks great on your screen that little star by the letter I, now blown up to full-scale looks out of place or can seem like a print error when viewed in the room. 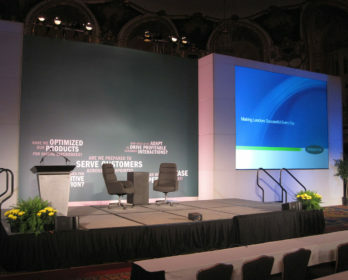 If you’re designing the General Session Room graphic, it will be sitting behind the stage. 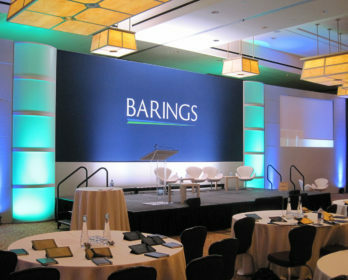 Most stages are 2’ tall and will obstruct the lower part of your design. 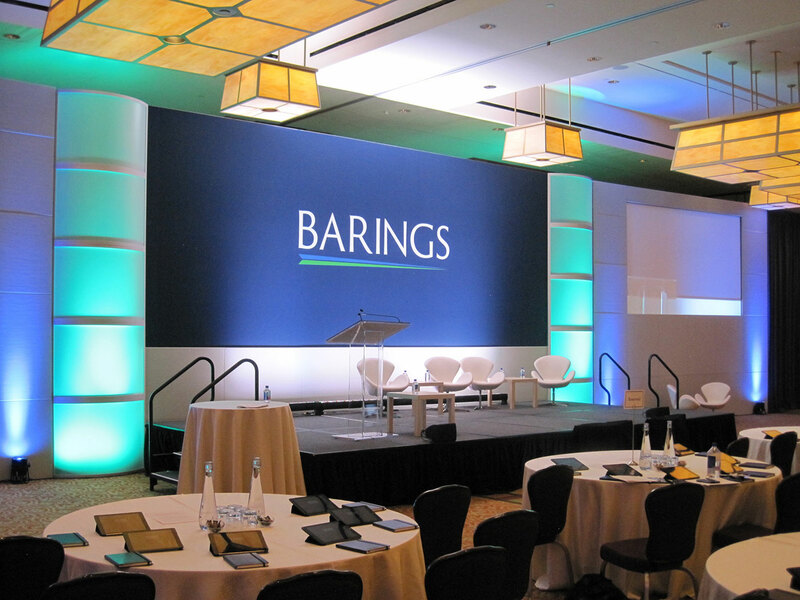 While other designs may be elevated impacting the ideal logo and meeting theme placement. 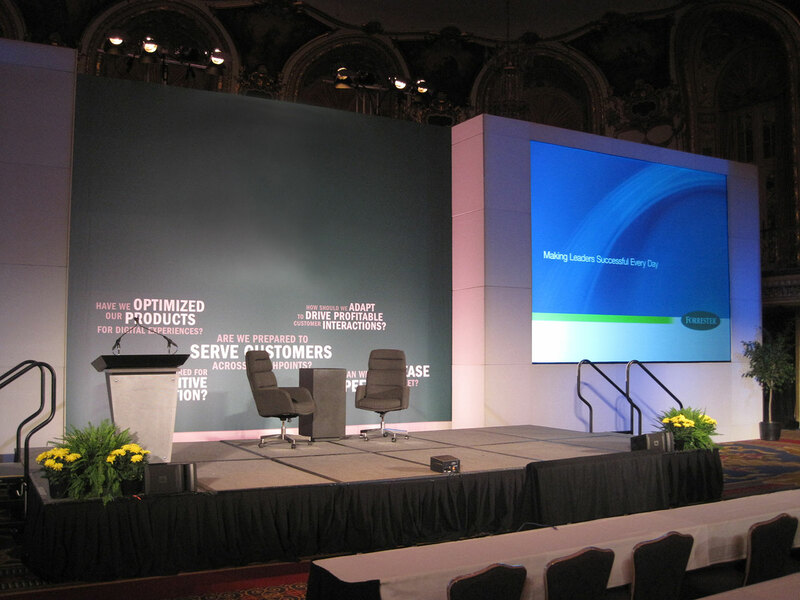 Check with your producer to confirm the stage height, check the elevation of the graphic, and inquire about podium and furniture placement. If the presenters are on camera for the event, please discuss the camera angle and shot with the producer. 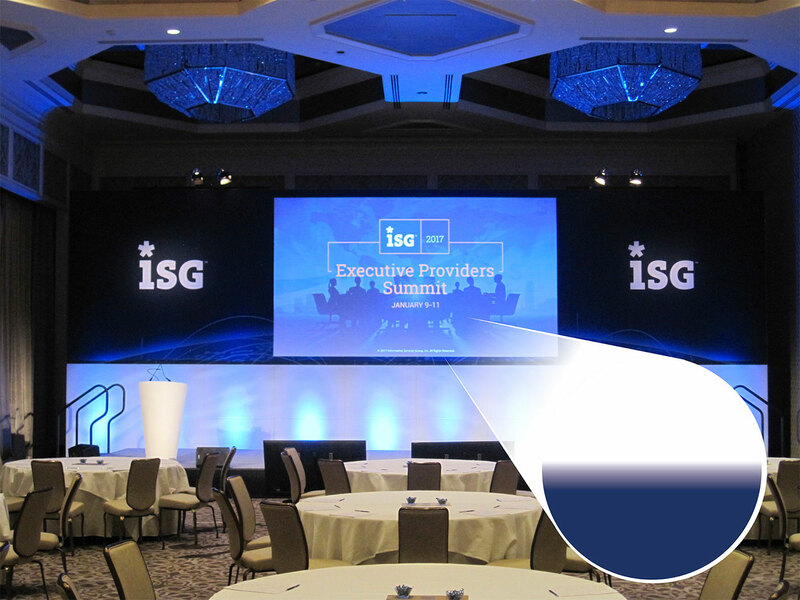 It’s important to avoid the appearance of letters growing out of presenters’ heads or situations where words can be partially blocked by presenters creating new words that are magnified on large projection screens. 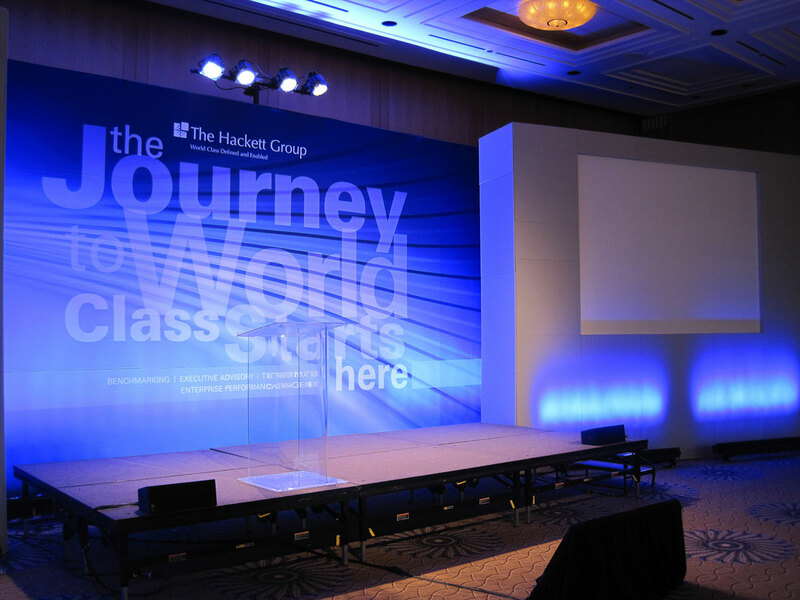 If your planning on incorporating a projection area into your design we suggest using a 3/4” soft gradient to transition from your design into the white projection area. The gradient will allow the Audio Visual team to define the projection area with light creating clean, crisp lines. Printing uses CMYK or (Cyan, Magenta, Yellow, Black) inks to absorb (subtractive color) from light that is reflected off the surface which starts as “white”. By identifying the CMYK values for all the colors used in the artwork, we have a map for how the colors should represent when printed.